Elon Musk is back making “big, dreamy, promotion-filled promises,” said Peter Holley in The Washington Post. 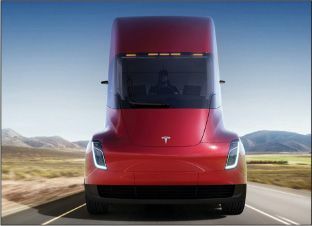 The Tesla CEO last week unveiled his latest futuristic creation: Tesla Semi, a partially autonomous, all-electric big rig capable of hauling 80,000 pounds of cargo and traveling 500 miles on a single charge. The truck, Musk claims, will “not break down for a million miles” and produces zero emissions. Declining to disclose a price tag, Musk contended his electric Semi would run 20 cents cheaper per mile than typical diesel big rigs. The long-delayed announcement followed “weeks of disappointing headlines” about Tesla’s main California factory, including revelations of major hiccups in the production of the company’s Model 3 massmarket sedan. Tesla enthusiasts briskly brushed off those issues, swooning at the Semi prototype. It looks like “something Batman might have designed,” said Marco della Cava in USA Today. It is “a shot across yet another industry bow” from a company upending automobiles, solar energy, and even space exploration.